This summer my six year old spends his days at camp swimming, going on cool field trips and playing Pokemon cards. My girl and I have been left with many hours of free time. 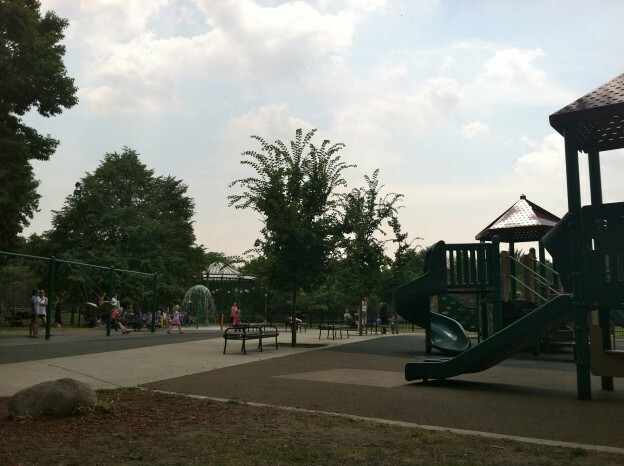 In an attempt to be outside as much as possible, we spend at least 2 hours a day at our neighborhood park. My daughter seems happy going down the same slides and swinging on the same swings, but I am tired of the same old park; especially thinking there will be at least two more months of this monotony. I know Chicago has countless parks, so I am asking you, my readers, to tell me your favorite parks in the city. My daughter and I will visit these parks you rave about and rate them for you. Thank you to my Facebook and Twitter friends for helping me compile this list of (predominately north side) parks in our city that we will explore this summer. I figure there are about 8 weeks left of summer and I have 8 parks above to visit. Each week I will write the good, bad, and parking situation for each playground. Did I miss any top playgrounds in the city? Please share and I will add them to my list. One more thing, if any of you want to join me on these excursions; I'd love to have the company and the opinions. If you aren't sick of me yet, check out my Guest Posts at Momsay, The Best of June and over at A City Mom debating City versus Suburbs. I'd add Sunshine Playground in Lincoln Park (right next to North Pond Cafe). While the equipment is not the best -- think old school wood equipment like you grew up with -- the views are incredible. You can sit and watch the city/pond for hours. If you get bored with the equipment, you can take a walk around the pond, see the ducks, turtles, and birds. It's also easy to stop in the Nature Museum or head to the zoo for a little bit without having to get in a car. Finally, it's walking distance to the beach or to the miniature golf course at diversey in the park. Thanks, Kevin. I used to live over there and miss all the activity going on in the park. We will check out the playground for sure; at the very least on our way to the Green City Market. It would be interesting to examine the number and quality of park district programs on the north vs. southwest sides. We have few options over here. I haven't gotten a chance to write about this but maybe you'll be able to. The Chicago Park District Web site can be a good starting point. Great idea, Ray. I will try to incorporate some of that in my future posts.